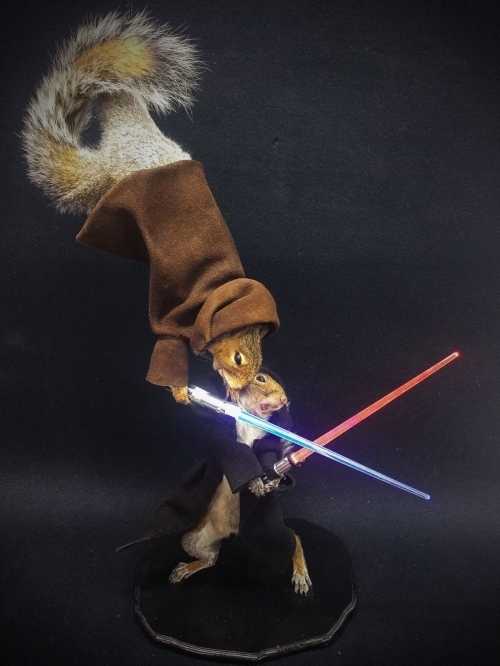 Teeters’ Taxidermy Studio from Halifax, Pennsylvania, has created this amazing mount of a Star Wars Jedi squirrel and a Sith squirrel captured in mid-fight, a piece that's available on eBay. This is an awesome ONE OF A KIND Star Wars themed squirrel mount, perfect for the Star Wars super fan who has everything. The detail is incredible as you can see from the pictures. These are 100% real squirrels that were mounted by a professional taxidermist. They are equipped with jedi robes and a gloss black base, and YES..... light up light sabers. The light sabers are super bright and easily removable from the squirrels hands and batteries can be replaced. It measures approximately 25 inches tall. May the force be with you.